When sitting in class (at the beginning, end, and during instruction), a student should sit in the Seiza position – this is a formal Japanese sitting posture. Some call this “sitting like a samurai” as you want to be focused and attentive. If this is not physically comfortable because of injury or limitation, cross-legged sitting position is acceptable. Slumping, slouching, or leaning won’t help your practice of centering and balance. Men should have their knees apart; it is fine for women to sit with their knee together. When training with weapons (Boken and Jo) students should start in Zanshin and complete a sequence of training in Zanshin. Zanshin is at least a 2-3 second pause, a settling or meditative state. 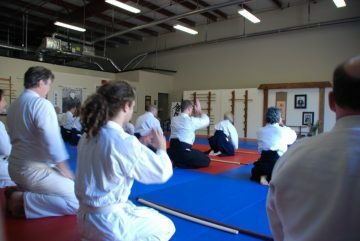 When partnering with weapons students should bow and use the inviting language used with tai-jitsu (open-handed techniques) and close with a thank you.